Exactly 115 years after the opening ceremony of the town hall building (Sunday September 27, 1903), residents and visitors to Rokytnice nad Jizerou can now enter the town hall attic and climb the 88 stairs to the viewing balcony of the 37m high town hall tower. Welcome to our small charming town located in the highest mountain range of the Czech Republic dominated by the magnificence of Lysá hora and Kotel. Our tourist and sports centre is situated in the western corner of the fascinating Giant Mountains. The history of Krakonoš’s settlement dates back to the year 1574. It includes four picturesque parts: Horní and Dolní Rokytnice, Františkov and Hleďsebe. During its development, it was considerably influenced by textile and glass industry. Beautiful countryside – active as well as passive holiday; this is the main attraction the town offers nowadays. 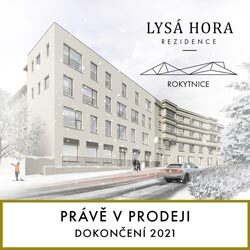 In Rokytnice nad Jizerou, the visitors can choose from several forms of accommodation (private accommodation, boarding houses, apartments, mountain chalets and cottages, and hotels). In their free time, they can use a wide range of services and facilities of our recreation centre. Well-maintained cross-country ski trails and slopes are waiting for ski lovers. In case of need, they can be covered with artificial snow. Complete care, i.e. service of both downhill and cross-country skis, is provided by ski-services. Further, there are ski rentals offering snowboards, downhill as well as cross-country skis and sticks, carvings, ski boots with buckles, ski boots as well as ski-overalls. Ski instructors in various ski schools are ready to provide interested skiers with necessary skiing knowledge. SKIBUS, a special bus modified for skiers, goes directly to the skiing centre. In the skiing centres of Rokytnice nad Jizerou, downhill skiers can use 28 ski lifts and a four-seated chairlift to the very top of the mountain Lysá hora. The chairlift Horní Domky is 2.198 m long, and is the second longest in the Czech Republic. We recommend the cross-country skiers to try high-quality white trails in the areas U kapličky and Pod Dvoračkami. Visitors who do not fancy skiing can try snowtubing – very interesting downhill ride on inflatable tubes in an artificial snow track. In other months, Rokytnice nad Jizerou offers the tourists a wide range of high-quality activities. A network of marked tourist trails both for walking and cycling tours is available. Huťský waterfall, Studenov, Rezek, Dvoračky, the spring of the Labe river as well as magical panoramas from the ridges of our highest mountains are not very far from here. Besides tourism, the promise of rich experiences is held by horse riding, skittles and bowling, bobsleigh track, kart racing, tennis courts and rock climbing. A fully-equipped sports hall and sauna are available, and for lazing, there is local cable TV. Picturesque pubs, pleasant restaurants, wine bars, a disco, a cinema as well as small bars will definitely contribute to your comfort in Krakonoš’s paradise. During the summer, tourist transport lines of the Giant Mountains modify their timetables and thus allow trips to Harrachov, Špindlerův Mlýn, Pec pod Sněžkou and other attractive destinations. To enhance your travelling experience, we recommend trying a rarity – a cog railway (the so-called "zubačka") from Kořenov to Harrachov. The info centre / travel agency of Rokytnice provides all necessary information, season tickets for turnstiles, maps, trips to surrounding localities (even with a guide), and other services. 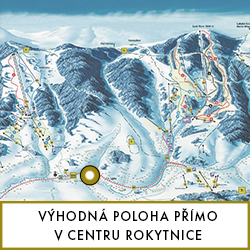 At our website www.rokytnice.com , you can follow current weather, snow situation; it is possible to find out information about tickets and pricelists in ski areas, operation of lifts, complete snow reporting including avalanche situation and snowdrifts. Panoramic webcams at the square and in the Horní Domky area by the Světlanka chalet will allow you to look directly into the heart of the tourist and skiing centre. Come in and make yourselves at home!! !